New Lawns: Mix 1 to 2 inches of All Purpose Peat into top 4 to 6 inches of soil. Rake seed in lightly with a leaf rake and roll area if possible. Water gently when soil becomes dry. Established Lawns: To top dress established lawns, spread All Purpose Peat 1/2 inch deep on lawn and work down into grass. Flower & Vegetable Gardens: Mix 1 to 2 inches of All Purpose Peat into top 4 to 6 inches of soil. Plant flowers or vegetables and water when soil is dry. Roses: Place mixture of 1 part All American Manure and 3 parts existing soil in bottom of hole. 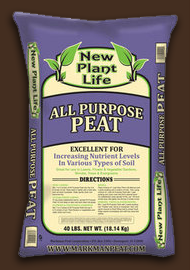 Then using mixture of 1 part All Purpose Peat with 1 part existing soil cover roots and fill to desired level. On established roses spread 20 lbs. per 100 sq.ft. of bed area. Mix lightly into the top 2 inches of soil. Shrubs, Trees & Evergreens: Mix 1 part All Purpose Peat with 2 parts existing soil. Position tree, shrub or evergreen, then use same mixture to finish filling hole to proper level. Water plants immediately and refill any area that settles.